Line a roasting pan with aluminium foil. Stuff the cavity of the snapper with the basil leaves and set aside. Heat the peanut oil in a large frypan over high heat until it begins to smoke. Place the snapper in the frypan, and quickly brown on both sides, about 1 minute total. 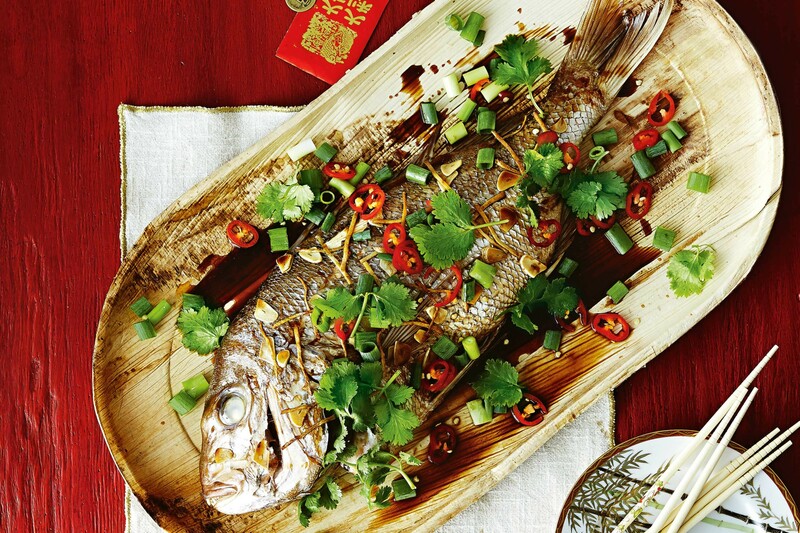 Place the fish into the roasting pan, and sprinkle with fish sauce. Reserve the peanut oil in the frypan. Meanwhile, heat the remaining peanut oil in the frypan over medium heat. Stir in the garlic, ginger, chillies and yellow capsicum and cook until the capsicum has softened, about 5 minutes. Stir in the sugar, rice vinegar, water, and tomatoes. Bring to a simmer over medium-high heat until thickened to desired consistency. Pour the sauce over the snapper, and garnish with extra basil leaves to serve.